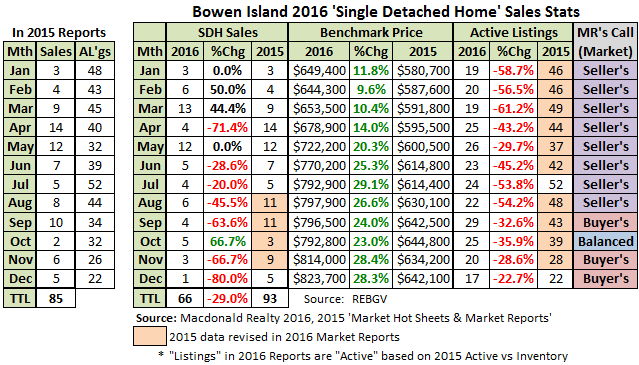 My last 2016 Bowen Island sales stats post (#2) took reporting up to and including September. This post will cover all of 2016. 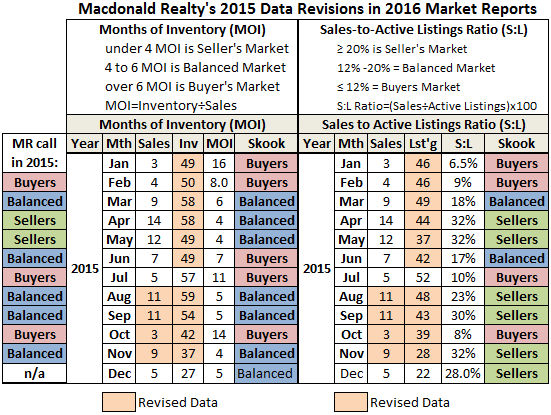 I would like to mention that I turn to Macdonald Realty (MR) for BI’s real estate sales data. I have been using their monthly reports since they began posting them in Dec 2014. MR uploads reports for each REBGV market area, Vancouver Island, and the Okanagan. These stats are posted to their blog page. MR began posting their new stat “lite” report Jan 2015. The previous .pdf file was replaced by a .jpeg image like the Bowen Island Jan 2016 example below. 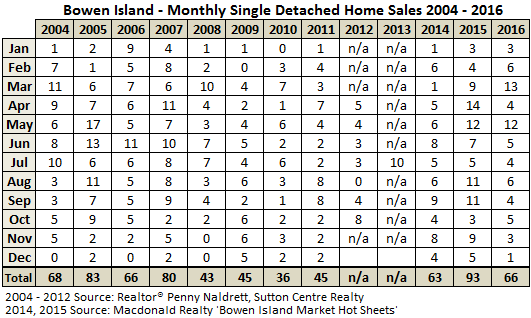 For larger centres, the jpeg includes condo/townhome sales. The report gives you the Benchmark price and only percentage change YOY and the same for Active Listing and Sales. To determine the previous year’s number, you will need good algebra skills. Or if you’re me, create a 2016 table using the original 2015 numbers to determine percentage change and if the percentage change doesn’t match then keep changing the 2015 number until it does. My efforts are in the 2016 table below. All the orange highlighted figures are the changes to 2015 data needed to match the percentage changes given in MR’s 2016 reports. You can compare those changes with the original 2015 figures in the left hand table. The 2016 table shows MR revised 2015 total sales from 85 to 93. MR gets its sales data from the REBGV and if a small market like BI has this large a revision you wonder what happens year-to-year in larger market areas. The 2016 table also shows MR’s market status call on the right. I’ll take closer look at these calls later in the post. The table below gives an historical look at BI sales and is straight forward. We see that 2015 was a banner year for BI and 2016 sales ended dropped -33.3% by comparison. This is understandable with supply exhausted as the table above clearly shows. Because of BI small market size, I chose to create a 12-month rolling sales chart rather than one illustrating month to month sales. On the plus side, the rolling chart better illustrates sales trending and we see they took off mid-2014, went ballistic early 2015, peaked March 2016 and have been falling ever since. Again, supply and to some extent price are having a major impact on sales. There have also been changes to rules governing real estate by both levels of government - a topic to be discussed in a future post. 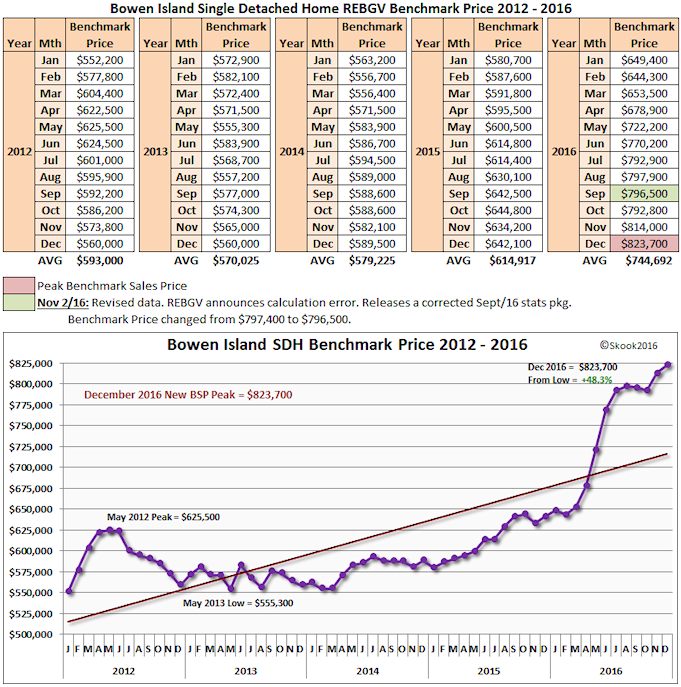 I think we might all agree that the Benchmark sales chart is just plain “crazy-stupid.” 2016 ended the year with a new peak Benchmark price of $823,700 keeping in mind that there was only one Dec sale not that it mattered since it rose again in Jan 2017 (3 sales). I created the small table below to show the percentage change in the benchmark on a month-to-month basis since 2014. I used the May 2012 Benchmark peak until a new sustained peak was reached which I chose as August 2016. The Peak changed again in November and December, 2016. Now, let’s take a closer look at MR’s decision to report BI’s market status each month. The table directly below is how MR called the market in each 2015 monthly report. But, many of those figures above changed with MR’s 2016 reporting - as I highlighted in the 2016 table. So, in retrospect, it’s likely some of the calls in 2015 would have been wrong. My research shows there’s more than one method to determine market status. You can use Months-of-Inventory (MOI) which is often referred to as the “absorption rate” or there is the Sales-to-Listing ratio, but here it gets confusing because you can use “active” listings or “new” listings and the REBGV uses both. In the Board’s monthly report, it will use the Sales-to-Active Listings Ratio in its New Release, but then offers up a Sales-to-New List Ratio on the ‘MLS® Listings Fact’ page and nowhere has there ever been an explanation in the stats package why it does so and the value of active verses new ratio - I know because I checked each stats package going back to 2001. The best explanation I could find for the use of these two ratios was offered by Toronto Realtor® David Fleming in a Jan 20, 2016 post at his TorontoRealtyBlog.com site. It makes sense what he writes but I can’t begin to explain it so it is best to read it on your own, if interested. 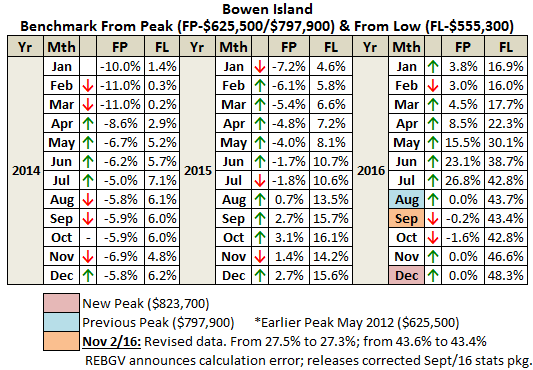 So, the table below shows MR’s actual status call in 2015 on the left and what happens to the call when the sales/list numbers were revised. 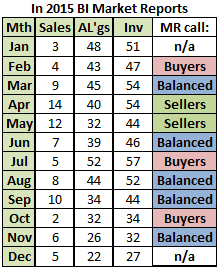 I didn’t know if MR was using MOI or Sale-to-Active Listings so I looked at both and you can compare the results, but in using either method the revised stat changed the call for some months. Now, since 2016 sales/listings have yet to be revised maybe we can determine what method MR is using to call market status. If you scroll back up to the BI Jan 2016 report image, you see its creator declared: "Listings are down. Sales are up. It’s a Seller’s Market.” Well, that sounds scientific, doesn’t it? Yet, if we look at the table below, MOI shows it was a Buyer’s Market and the Sales-to-List Ratio shows it was a Balanced Market. Damn. Then the creator switched to “Listings are down. Prices are up. It’s a Seller’s Market” in April, but the MOI says it was Buyer’s Market and the Sales-to-List Ratio says it was a Balanced Market. 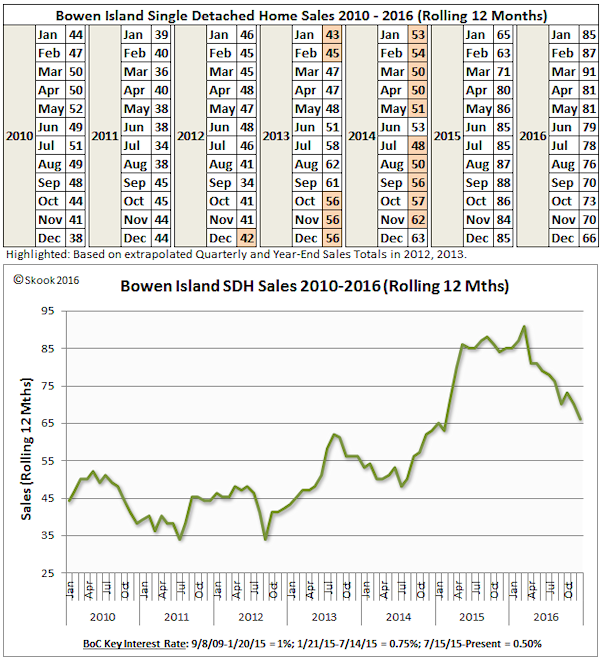 In August, the declaration changed abruptly to: “It’s a Buyer’s Market in Bowen Island” and this pattern continued to the end to the year. Now, beginning in Sep, the table indicates the report’s creator is likely using MOI as their guide. So, what I see are two different individuals producing these reports and the change-over came in August. My thought is the first individual wasn’t strongly familiar with either method and went with logic. If Listings are down and Sales or Prices are up, the only happy person is a Seller. In a market the size of Bowen Island, logic seems the best method to use. In this bubble, to be making a Balanced or Buyer’s call looks plain ridiculous. Oops, me bad, I’m forgetting that the real estate market in Vancouver is for millionaires or...the crazy-stupid.